Make sure your recycling is setting out the night before! Our recycling routes run early in the morning. 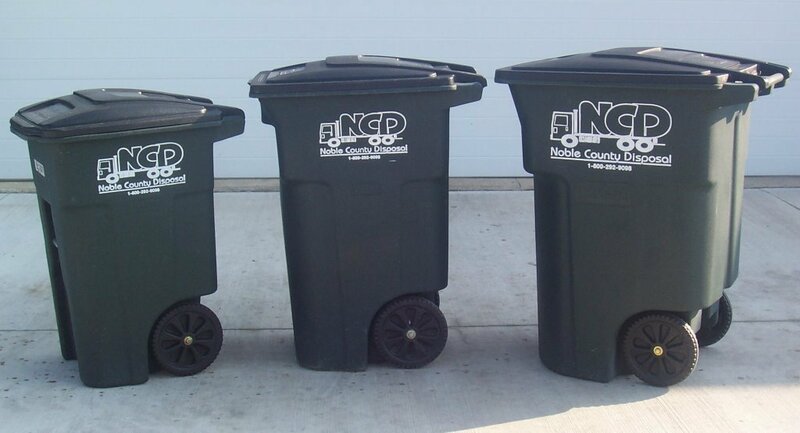 Put trash out the night before your service day because route times can fluctuate. Our tote options: 48, 64 & 96 gallons. All customers must use one of our totes for service. Any bags beyond the tote is $1.50 per bag. Lid can be open 6 inches without being charged extra. Excessive trash will be left behind unless you call and make arrangements with the office. Total current charges due by due date during quarter. Previous balances due upon receipt. You will be charged a service charge on 90 day past due balances. Services will be discontinued without notice for failure to pay. If discontinued a $10.00 restart fee will apply and must be paid before restarting. Holiday Notice: No pick-up on the following holidays: New Year’s Day, Memorial Day, Labor Day, July 4th holiday, Thanksgiving, and Christmas. Weeks containing these holidays, trash service will be one day later, starting after the holiday. To get holiday information direct – email us at info@ncdisposal.com with Holiday Info in the subject line. You can always call office after hours and listen to our machine for holiday hours. We cannot haul the following items: batteries, tires, yard waste, wet paint, oil, electronics, fluorescent light bulbs or other hazardous wastes, concrete, brick, dirt or ashes. Diabetic needles can be hauled in hard plastic containers. Appliances , furniture or big items can be arranged for special pick-up. Hauling fee may apply. You will need to call the office to arrange for such items. There is a $25 charge for returned checks. Autopay options are available or pay online on our website. When using your own cans, all trash must be bagged–failure to do so will result in having to use one of our totes. Totes are the property of Noble County Disposal, Inc. This pricing is for normal household trash each week…extra pricing applies to heavier trash. Mishandling or abusing totes beyond normal wear and tear will result in $75 replacement fee. Please call office in reference to details. If you are interested in a residential tote, call (260) 349-9150 or (800) 292-9098. Due to Indiana regulations: No electronics can be disposed of on route (Indiana Code 13-20.5) with municipal waste that is intended for disposal at a landfill or intended for disposal by burning or incineration. Electronics referring to: Computer Monitors, computers, televisions, printers, computer peripherals (such as keyboards and mice), DVD players, VCR’s, or fax machines. We offer service daily, bi-weekly, weekly, bi-monthly, & monthly to meet your needs. Roll-Off Boxes for weekly demands and more. Gone Green? We offer several green programs that will suit your needs! Items that carry an extra charge will not be hauled without prior approval by customer! You must call the office to arrange pick up. Overstuffed Recliner, Mattress/Box Springs, Sofas, Table and chairs. If you are interested in a extra hauling, call (260) 349-9150 or (800) 292-9098. *Noble County Disposal is not responsible for yard damage due to placement of roll-off. 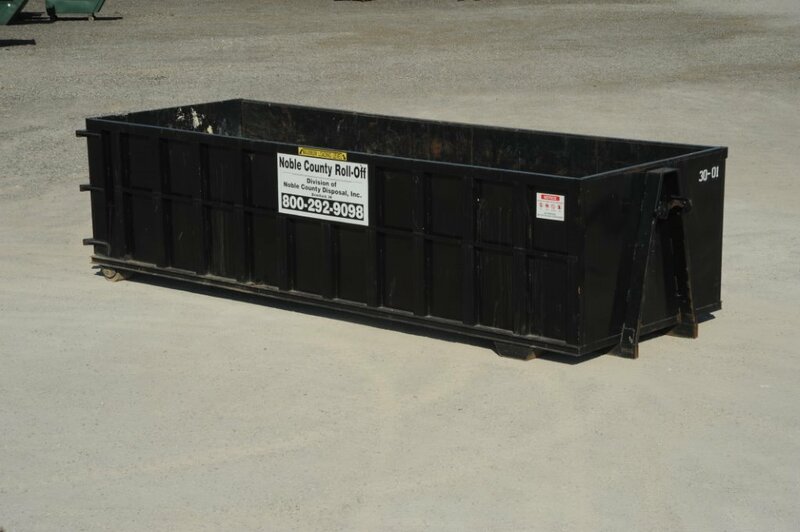 If you are interested in a roll-off container, call (260) 349-9150 or (800) 292-9098. If you are interested in a clean up container, call (260) 349-9150 or (800) 292-9098.